Today’s experiences are stories of tomorrow. Transform your today’s experience as an episode for tomorrow! It’s quite some time since I blogged and today, I decided to share a delicious shake recipe that I made at home. It’s good to eat fruits in summer and I love to make healthy shakes with fruits. 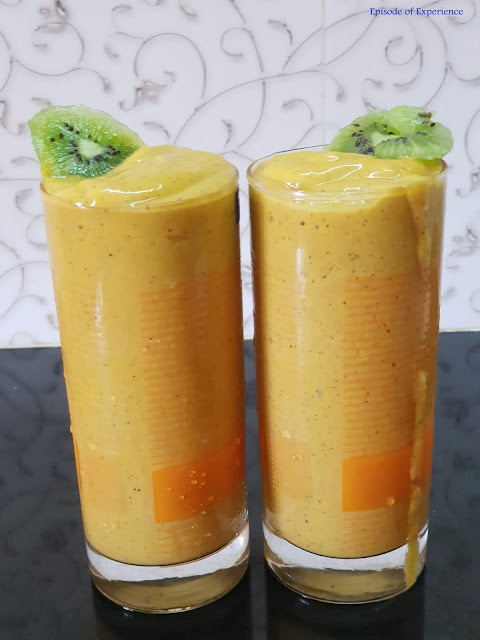 Today, I had 3 kiwi fruits and few mangoes in my kitchen so I decided to make refreshing kiwi fruit and fresh mango smoothie. Why Kiwi fruit in summer? Kiwi is low in calories, fat, and sugar. They are fiber-rich fruit enriched with vitamins and minerals. They are good for diabetes, cancer, heart diseases and it decreases the risk of obesity.